After moving to another country (or sometimes, continent!) or coming back from an exchange semester, starting off a new life can be challenging. While settling down in the lovely city of Vienna is not a big obstacle, there are other things that need to be done during this time to go back into the swings of things and start the semester right. As we all know, bonding with your fellow CEMSsies is at the top of the list! 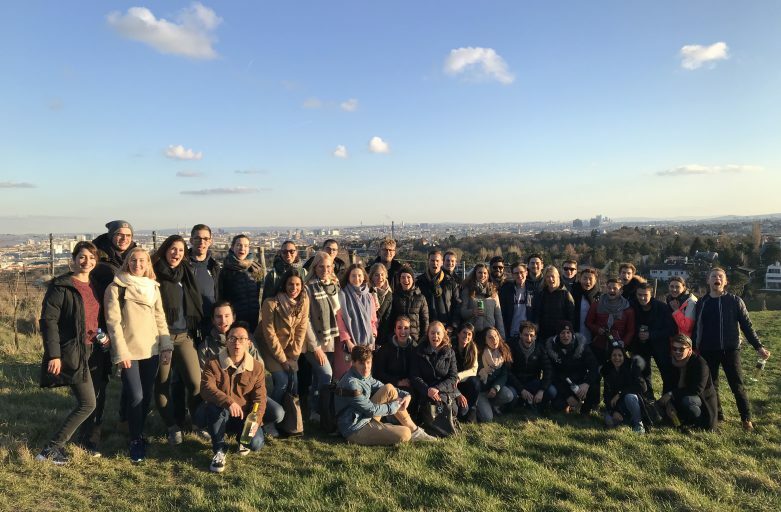 What amazing activities did the Cems Club Vienna organize to start an unforgettable semester? Did you know that the Innere Stadt was surrounded by high walls? And that Ferdinand I had fifteen children? The Vienna walking tour was the best way to discover the wonders of the Austrian capital and the mysteries behind its history and architecture. The historic centre of Vienna has no more secrets for our CEMSies! 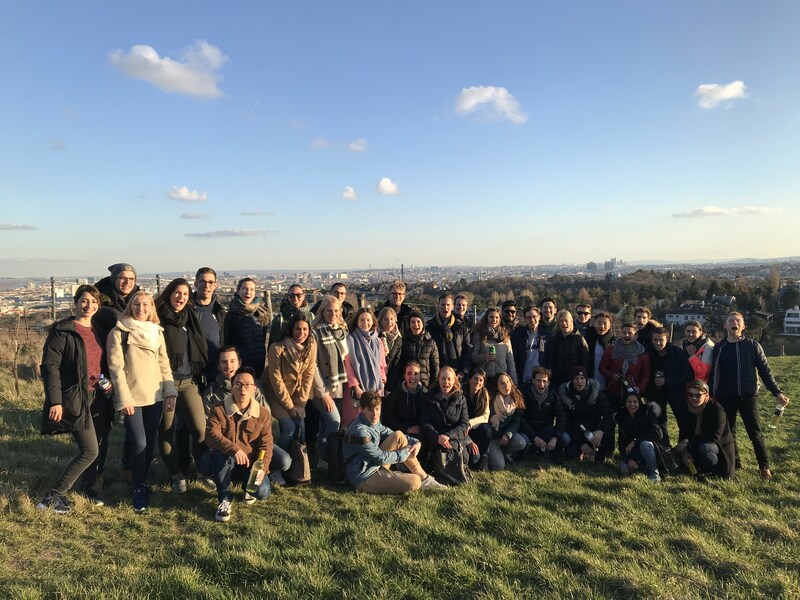 Nothing is better than a good hike to enjoy a breathtaking view of Vienna while tasting locally made wine. Kahlenberg is one of the most popular destinations for hiking-lovers: walking this hill is a unique experience for who wants to try the genuine taste of the city. We walked at the top of the hill at Cobenzl and from there down to the village of Neustift. The day was concluded with a delicious traditional Austrian dinner at one of Vienna‘s most well known Heurigen! Bowling is one of the funniest team sports ever: it doesn’t matter if you are a bowling king or a clumsy beginner (like most of us), cheering and supporting your teammates is what counts. The CCV organized a bowling night in two rounds – a warm-up session and a championship round – and the team with the highest score won a special prize and eternal glory! What’s a CEMS Welcome Week without a Pub Crawl? This activity is one of the top things to do to explore the exciting nightlife in Vienna and discover local bars and pubs. We were split into teams to play different drinking games – and challenge the other teams. At each stop we could collect precious points to become the winning team of the night and being awarded with… more drinks! A big classic to explore every corner of a new city while having fun with your teammates is doing a treasure hunt. Our CCV gave each team a list of challenges to complete – from dancing the macarena in front of the Opera House to proposing to a stranger – and the goal was to complete as many tasks as possible. Guess how we concluded this day discovering the viennese traditions? With the most precious treasure of all – the Wiener Schnitzel! And to conclude this amazing Welcome Week … we partied! After a cultural pre-drink and pregaming, we headed to one of the best clubs in Vienna to dance hip-hop all night. What’s a better way to kick-off this new adventure? Please find an overview of our events. To stay up to date, please visit our Facebook page. Copyright © 2019 CEMS Club Vienna. Theme: Himalayas by ThemeGrill. Powered by WordPress.